What does it mean for Mary to be the Queen of Heaven? Well, in the Old Testament monarchy the Queen of the Davidic Kingdom was the Queen Mother. The Kings, for reasons of state and human weakness, had many wives, none of whom fittingly could be called Queen. That honor was reserved for the mother of the King, whose authority far surpassed the many "queens" married to the king. We see this in the history of Middle Eastern nations of the time. We specifically see this is the role Bathsheba played with respect to King Solomon and the occasions when the Queen Mother acted as regent on behalf of juvenile successors to the throne. Remember, the Jews wanted a king in order to be “like all nations”. Thus, following the models of the neighboring lands, they established a dynasty, a legal system, a royal court – and a queen mother. She was the “Gebirah” – Great Lady. Aside from the prophetic types present in the Kingdom of Judah, there is also the text of Psalm 45, which when speaking of the Kingdom of God also speaks of its Queen. That Kingdom ruled by God is the same as the Kingdom ruled eternally by the Son of David. It is not an earthly kingdom (though it is present on earth in the Church) but rather a heavenly kingdom, the Kingdom of God. The Queen of that Kingdom is the Blessed Virgin Mary, the Mother of the Lord God Jesus Christ. The Jews who knew Jesus would have understood this perfectly. Jesus is “Son of David” who would inherit the throne of David. And who would inherit the throne at his side, the seat of the Queen Mother? His mother, of course. A great resource on this issue is the book "Hail Holy Queen" by Dr. Scott Hahn"
Last edited by CatholicCrusader : 10-29-2013 at 01:53 PM. The Virgin Mary's title, "Queen of Heaven," is attacked by many non-Catholics and accused of idolatry, paganism and heresy. However, according to the Catholic Church, the Virgin Mary is indeed QUEEN OF HEAVEN. Her title is supported in Scripture and in history. If we look at Scripture and in history, the mother (not wife) of the king in the Davidic kingdom is "Queen." For example, Prophet Jeremiah calls the king's mother, Queen. "Say to the king and the queen mother: "Take a lowly seat, for your beautiful crown has come down from your head." (Jeremiah 13:18) King Solomon's mother is "Queen Bathsheba" who sat on King Solomon's right. Note in Scripture King Solomon rose at her entrance and bowed down to her? "So Bathsheba went to King Solomon, to speak to him on behalf of Adonijah. And the king rose to meet her, and bowed down to her; then he sat on his throne, and had a seat brought for the king's mother; and she sat on his right." (1Kings 2:19) We also see homage given to the Virgin Mary by Angel Gabriel at the Annunciation when he appears to Mary and also tells her that her Son, Jesus, will be given the throne of his father, David. (Luke 1:32) Jesus, who is born in the Davidic line (the House of David) is called "King of kings." (Timothy 6:15, Revelation 19:16) Jesus' title, King of kings, would make His Mother, Mary, "Queen of queens. "This is Jewish history and the Jewish custom of Israel. We not only have Jewish history, but Scriptural support to the Virgin Mary becoming "Queen" through her Son, Jesus', Kingship, King of kings, Ruler from the Kingdom of the Heavenly Jerusalem. God also says we will have a Queen. "...daughters of kings are among your ladies of honor; at your right hand stands the queen in gold of Ophir...the people of Tyre will sue your favor with gifts, the richest of the people with all kinds of wealth [spoken to the queen]...I will cause your name to be celebrated in all generations; therefore the peoples will praise you for ever and ever [spoken to the queen]. (Psalms 45:9,12,17) All generations? Who would this queen be? The Virgin Mary herself saidall generations will call her "blessed." 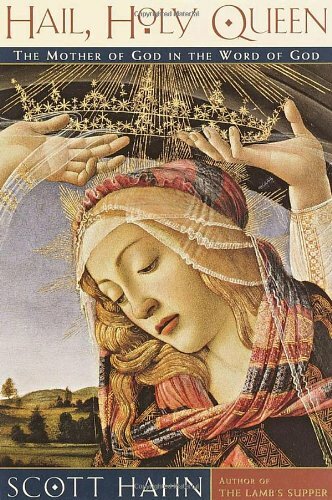 (Luke 1:48) In Revelation, Mary is the woman clothed with the sun, with the moon under her feet, and on her head a "crown" of twelve stars. (Revelation 12:1). One of the arguments against the Virgin Mary's title, Queen of Heaven, is, the title was used for a pagan goddess. In the Prophet Jeremiah we read, "The children gather wood, the fathers kindle fire, and the women knead dough, to make cakes for the queen of heaven,..." (Jeremiah 7:18) Therefore, the Virgin Mary's title, Queen of Heaven, would also imply she too is a "pagan goddness." However, Jesus' title, King of kings, was used for the pagan Nebuchadnezzer. "You, O King, the king of kings, to whom the God of heaven has given the kingdom, the power, and the might, and the glory,..." (Daniel 2:37) Using this same logic, Jesus' title, King of kings, would also imply that Jesus is a pagan King. But of course these same non-Catholic Christians wouldn't debunk Jesus over a title that was used for a pagan. So why debunk the Virgin Mary who was given the title fitting for her and used for a pagan goddess? We also see intercession to King Solomon from his mother, Queen Bathsheba. "Then she said, "I have one small request to make of you; do not refuse me." And the king said to her, "Make your request, my mother; for I will not refuse you." (1Kings 2:20) The intercession shows the queen possesses power in the royalty of her son's kingship. We also see in the first Miracle of Jesus at the Wedding Feast of Cana the intercession of Mary (the Mother of Jesus). She seeks help from Her Son, Jesus, and tells Him,"They have no wine." And then tells the guest, "Do whatever he tells you." (John 2:1-11) Jesus being a guest like any other guest would have allowed this crisis of running out of wine to happen. After all, Jesus is only a guest and not the person that anyone would turn to for help. His ministry has not yet begun before the crisis at Cana. But His Mother knew Her Son could help and interceded by making a request to Her Son on behalf of the peoples needs and wants. Mary's intercession for the people that began at the Wedding Feast at Cana (the beginning of Jesus' Ministry and the changing of their roles) continues today. Mary, as Queen of Heaven, continues to intercede on our behalf. Is the designation the "queen of heaven" even a good thing? "Seest thou not what they do in the cities of Judah and in the streets of Jerusalem? The children gather wood, and the fathers kindle the fire [light candles? ], and the women knead their dough, to make cakes to the queen of heaven, and to pour out drink offerings unto other gods, that they may provoke me to anger. "Thus saith the LORD of hosts, the God of Israel, saying; Ye and your wives have both spoken with your mouths, and fulfilled with your hand, saying, We will surely perform our vows that we have vowed, to burn incense to the queen of heaven, and to pour out drink offerings unto her: ye will surely accomplish your vows, and surely perform your vows. Should we then name one, even a 'goodly' woman such as Mary, the mother of Jesus, apparently was, as the queen of heaven, which God has so strongly denounced because of the sin the people of Judah did on her behalf? Are we better than Judah? Do we need the Messiah less than Judah? Really. Is not Jesus a King in the line of David? Several times he is called "Son of David". Thats no straw. Amadeus: If you read the examples I cited, CC, then you see that I meant there was not even a reasonably logical basis for the argument using David's mother. She was guilty of adultery. She approached Solomon with a request on behalf of another that was nigh onto treason as seen in the eyes of the wisest man who ever sat on the natural throne of Israel. It was not her request, but if Bethsheba is symbolic of someone we are to ask to intercede for us, she is a very poor example to use for a symbol. People can pick scriptures to support nearly any belief that they wish to support. This as you would be quick to note is a primary reason that there are so many different Christian organized churches. To use the mothers of kings as a reasonable basis, we should be able to find a number of mothers of kings, [or even one], who were similar in some way to Mary. There is not even one good example that the article used. David's mother was an adultress. Yet, you will be quick to say that Mary never committed a single sin. Do you not see the problem? CC: Try to remember that when we read the scriptures in context, that does just not just mean in the context of other scriptures, it also means in the context of the culture at the time of the men who wrote them. These men were Jews, steeped in Jewish tradition. They long awaited a new king. The men who wrote the scriptures would have been very very comfortable considering Mary as Queen Mother to the King, Jesus. Amadeus: How many of those men do you know CC? Of course, the answer is none! No one living in the flesh today knew any of them since the last natural king of natural Israel died more than 2500 years ago. How well can any of us today know any of them based on available writings? No doubt the natural Jews awaited a Messiah, a King. That much we can see in scripture, but to presume that they would have been comfortable with calling Mary the "queen of heaven" is by any approach a very long stretch. I am not questioning your faith on this point, but neither the article nor you have presented anything to make me doubt my own doubt. I, for one, have never rejected monarchy. The Kingdom of God never has been and never will be a democracy. Men, as individuals, or as groups, or in majorities have never done very well with even the things of men for very long, much less with the things of God. Man cannot be trusted and that includes me! God on the other hand is always trustworthy. Any one who knows Him at all would be foolish to prefer democracy over theocracy with Him at the head of the government. The Jews wrote them as inspired by God, but that does not mean that an expert in ancient Jewish culture can understand the Way of God as described by scripture better than us! "So Bathsheba went to King Solomon, to speak to him on behalf of Adonijah. And the king rose to meet her, and bowed down to her; then he sat on his throne and had a seat brought for the king’s mother; and she sat on his right. Then she said, ‘I have one small request to make of you; do not refuse me.’ And the king said to her, ‘Make your request, my mother; for I will not refuse you’" (1 Kgs. 2:19–20). Amadeus: This is my point, CC! Solomon said that he would not refuse her, but he did, in fact, refuse her. The writer says that this is "probably the clearest example of queen mother's role", but it is not clear at all. Bathsheba showed herself to be very unwise by her action. Is this the picture we are to see in the "queen of heaven"? If you understand typology, you will know that OT "types" are imperfect representations of their NT fullfillments. Bathsheeba was a "type" of Mary, but she was imperfect and earth-bound. Mary reigns in heaven, and she would never ask anything of Jesus that was improper. Amadeus: Thank you for at least acknowledging that Bathsheba is not a perfect example. Really, I see her as not even a good example to support your contention. Saul was king as David was king. Both failed God during their respective reigns. We could never point to Saul as a good example of a Christian who has sinned but then repented and was accepted back into God's good graces. David, on the other hand, who on the face committed transgressions seemingly as bad or worse than Saul provides us with a very good example of the way for a Christian to proceed when he stepped off of the pathway toward God. Bathsheba reminds me more of Saul in everything that we know of her than of David! That Solomon respects and honors his mother means nothing as to what sort of mother she was. To compare her favorably with Mary who pleased God enough that He chose her for a special job is the clutching at straws, which I mentioned. Go ahead and give honor to Mary, at least, for her role in the birth of Jesus and His early life, but please do not use an known adultress who as far as we know never repented of her sin to establish Mary in anything. Last time I posted in a real old thread it got locked. I guess we're not supposed to post in super-old threads, so I just started the same one again. I did not think you were going to transfer our entire conversation over here. LOL. But to the very first line of your responses, "Is the designation the "queen of heaven" even a good thing? ": The truth is always a good thing. As I said, for the Jews, the mother of the King was the queen. Jesus is King, Mary is queen. Thats what it essentially boils down to. Last edited by CatholicCrusader : 12-10-2012 at 07:32 AM. (b) those to whom it is presented are ready to receive it - i.e. "strong meat" isn't given to "infants in Christ" who need milk, not meat. On that first point, on this particular subject, when it is explained what is meant by the term "queen" (i.e. the mother of the King) then obviously I agree. But the trouble is that language changes over time, and in common parlance these days, that isn't what most people understand by the term "queen". Hence confusion can arise, and for those who are already prejudiced / suspicious of Catholic teaching, the term can actually be a stumbling block. By the way, did you know, that in this country, Queen Elizabeth's late mother was always formally known as "Queen Elizabeth the Queen Mother"? Good point. I thought I did make it pretty clear several times that in the culture of the time, mothers of kings were queens due to the fact that kings had many wives and concubines. EDIT: Maybe I didn't say that after all. I thought I did. ........By the way, did you know, that in this country, Queen Elizabeth's late mother was always formally known as "Queen Elizabeth the Queen Mother"? I do know that, and that is probably a little carry-over from ancient times. Last edited by CatholicCrusader : 12-10-2012 at 07:55 AM. Yes, the truth, God's Truth, is always a good thing. I certainly do agree with you on that. As to Mary and Bathsheba, I have already expressed my opinion on the previous thread as copied to this thread. What seems to be truth to you doesn't seem to be truth to me. We will apparently continue to disgree for the present.